Families don’t want to go back to ‘funemployment’. 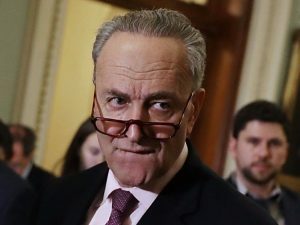 Stellar job numbers released Friday won’t mean much to the average American family because of other GOP policies, Senate Minority Leader Chuck Schumer, D-N.Y., said. Schumer, in a statement released hours after the Labor Department reported employers added 250,000 jobs in October, more than 30 percent higher than expected. He acknowledged the numbers “may look good,” but said they “coexist” with GOP tax cuts that are increasing the deficit. He also warned Republicans will end Obamacare. U.S. employers added 250,000 workers in October, the last month before the midterm elections. Incumbent Republicans have pinned their campaigns in part to the success of President Trump’s economic policies.